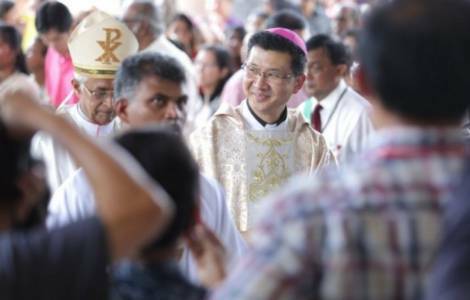 ASIA/MALAYSIA - Archbishop Leow: "Easter, politics and trust can go together"
Kuala Lumpur (Agenzia Fides) - "This year, Easter comes in the midst of the general election campaign where many politicians, old and new, are encouraging us to trust them. Easter, politics and trust: can they go together? Yes! Because the Resurrection of Jesus, amazing as it seems to be, is about our human transformation that leads us to the fullness of life in God. Easter is about healing what is wounded; it is about forgiving what is wrong; it is about upholding justice and uplifting the oppressed and downtrodden and above all, it is about trusting that there is a better way for us to live together as Malaysian": this is what is stated in the message by Archbishop Julian Leow Beng Kim, at the head of the Archdiocese of Kuala Lumpur, issued on the occasion of Easter and sent to Agenzia Fides. Speaking of the central event of the Christian faith, the Archbishop takes the opportunity to address the faithful and give an interpretation of the social and political moment in which the nation lives, projected towards the general elections, scheduled for next June. "The Resurrection of Jesus - notes the text of Archbishop Leow - is God’s response to polarity, divisiveness, racial and religious enmity. As the Easter people of today, let us continue to trust the message that changes lives. Let us work for understanding, dialogue and mutual respect between people of different faiths and in our own communities. Let us pray for our nation and for our politicians that they would be guided towards working for a fair, just and harmonious society in which the gifts and contributions of all people can flourish, and the tares of alienation and extremism find no soil in which to take root". The Archbishop notes: "Being an Easter people means that resurrection is part of our life experience. Easter is about life, new life, about Jesus risen from the dead, giving us hope when things feel hopeless, courage when we want to run away, confidence when we are vulnerable and strength in the face of adversity. Easter calls us to look for life among the living with grateful and joyful hearts. Easter calls us to move beyond the tomb and to share the good news of the Resurrection with one another. Easter calls us to courageously follow Jesus Christ, the risen one, and to boldly proclaim that out of darkness and suffering comes new life". Msgr. Leow relaunches the Easter message of hope: "There is hope for those on the peripheries of society; hope for governments and leaders; hope for the Church. The message of Easter is equally relevant to us as a nation. It should give us the assurance that we are able to overcome the adversities that we face in our country. As a nation, we must and can eradicate poverty. We must and can put an end to the destruction of our environment. The message of Easter must encourage us to put an end to all moral ills; it is time to turn our backs on dishonesty, bribery and corruption, violence and vengeance. The message of Easter must help us to turn our efforts to healing the wounds of division, reconciling broken families and reuniting communities".